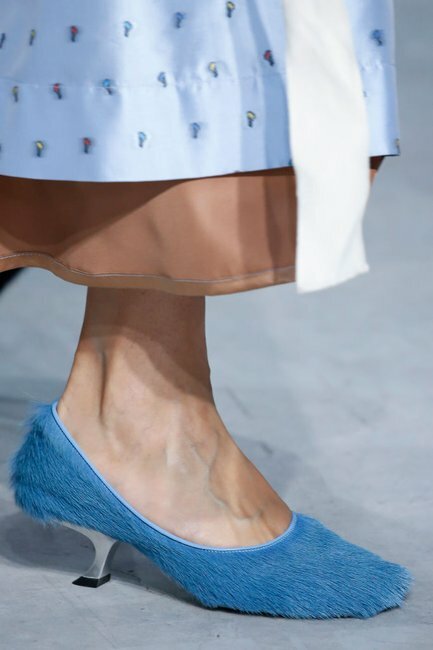 Kitten heels are back and the ugly fashion obsession continues. 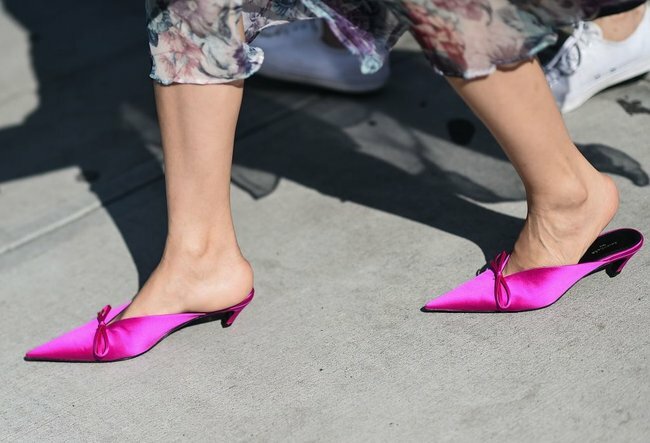 Why ugly kitten heels are back, and why you suddenly love them again. Something strange happened the other week. I was in Zara (not the strange part, it happens far too often) when I found myself drawn to a pair of black and white polka dot shoes. They were silk and pointed, chic. Then I turned them around and saw the heel. It was a kitten heel. The shoes with the tiny little heel about the size of a finger nail, so pointless it&apos;s almost not worth being there. The training-wheel heels we tottered around in as tweens then became a go-to shoe in the nineties before being banished to frumpy land. Here&apos;s the peculiar part... it didn&apos;t put me off. In fact, instead of dropping them like a hot potato, I almost, almost made my way to the till with them. Spotted on and off the runway at recent Fashion Weeks as well as in your Insta feed, this follows in the... erm... footsteps of other nostalgic nineties trends making comebacks like chokers and low rise jeans. But there&apos;s a bigger pattern happening here and it transcends any particular decade. So many of the &apos;big&apos; fashion trends emerging are a serious eyesore. Yes, they&apos;re really, really UGLY. Birkenstocks. Crocs. Bum bags. Platform-bloody-crocs. Why are we seeing so many ugly fashion trends of late? And why do so many of them involve feet?? Turns out there are a few reasons. First of all, they get people talking. You&apos;re far more likely to pause on your mindless Instagram scroll when you see something totally unexpected rather than something "pretty". "Instagram has definitely played a huge role in many of the ‘questionable’ trends we’ve seen of late," says stylist Alyce Cowell. "There are so many trends that work on social media — especially when they’re styled, worn and photographed by an effortlessly cool fashion influencer or celebrity— that just don’t translate into real life. I’m looking at you, fishnets!" For the brands creating (or rebirthing) the ugly trend, there&apos;s the hope that it will spark a "Birkenstock movement", that saw the recent tourists-only sandal become the hottest footwear trend (again) a few years ago after the &apos;cool girls&apos; claimed them for their own. According to Forbes, within two years searches for Birkenstock sandals had almost quadrupled. You probably even bought yourself a pair as a result. Listen: Stylist Sarah Elizabeth Turner on how to turn your wardrobe around. Post continues after audio. When Christopher Kane first sent crocs down the runway in 2016, it was unexpected and a little tongue in cheek. It gave crocs a link to high fashion and got the people talking, blowing up on social media. Unsurprisingly, he used them again this year. Now you can buy designer crocs with fur or embellishments that will set you back a casual $700. The most worrying part? People ARE. Seeing it given the fashion tick of approval on the streets, on the runway and on influencers on our screens can give us FOMO and slowly make even the ugliest fashion trend seem almost doable. It puts the doubt in our minds - maybe the gardener&apos;s shoe wasn&apos;t quite so... bad? Trends are also a direct response to those that have come before it. In answer to a stage of &apos;pretty&apos;, normcore and its anti-fashion look has dominated the shops. In terms of footwear, this has meant after years of platforms and high heels, we&apos;ve gone low and flat - just look at how popular the sneaker has been of late. The kitten heel is the natural progression; still comfortable and relatively practical but with just that little bit of extra height. So you have two choices - embrace or give it a miss. 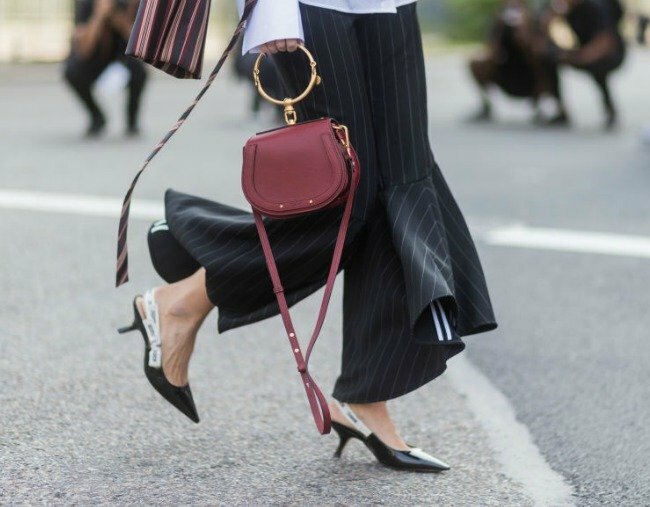 If you do fancy giving kitten heels a try, there are a few things to keep in mind. "Like most trends that return (flares, boilersuits, mid-00’s metallic camisoles that barely pass as a top) they can be scary at first. Firstly, never dive into a trend because it’s the hot new thing — nobody likes a fashion victim," says Cowell. "Be selective about the trends you wear and choose those that suit your personality and style, always adding your own twist. "If kitten heels is one of those trends, make like the fashion editors and try paring them with grown-up man-style clothing — think frayed hem jeans and a silk blouse, or tapered pants and an oversized blazer." Will you be trotting out in kitten heels? Tell us why (or why not!) below.